Size of this PNG preview of this SVG file: 365 × 365 pixels. Other resolutions: 240 × 240 pixels | 480 × 480 pixels | 600 × 600 pixels | 768 × 768 pixels | 1,024 × 1,024 pixels. 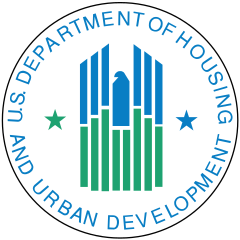 English: Seal of the United States Department of Housing and Urban Development. 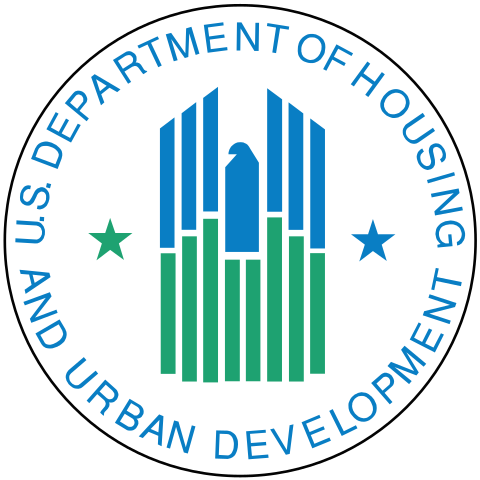 On a white background within a circle composed of the words, "U.S. Department of Housing and Urban Development," is an eagle and two stars. The six upper bars depicting the upper portion of the eagle's wings, the torso of the eagle, the star at the right of the eagle, and the words, "U.S. Department of Housing and Urban Development," are colored blue. The eight lower bars depicting the lower portion of the eagle's wings and the star at the left of the eagle are colored green." The seal is a representative of high rise buildings simulating an eagle and giving emphasis to the "urban" in HUD's name. The eagle (shown abstractly) is a symbol of Federal authority. The use of green symbolizes open space, land, growth and prosperity. The blue in the Seal alludes to the quality of life and environment in America's cities. Español: Sello del Departamento de Vivienda y Desarrollo Urbano. Français : Sceau du département du Logement et du Développement urbain des États-Unis. Source Extracted from PDF file here. Public domain, though other legal restrictions apply. This image is a work of the United States Department of Housing and Urban Development, taken or made as part of that person's official duties. As a work of the U.S. federal government, the image is in the public domain in the United States.